One of these days it's going to be spring. I swear it. A bit of sunshine arrived yesterday in a new publication out of the UK called Hoop-La! Such a pretty magazine all about embroidery. I love the way my project feature looks inside. I'm working on the stitched sample for this design. It should be in the shop in a week or so along with the other designs you have been asking for as well. Like everyone this winter, I've been hibernating in a deep snowdrift for the past few weeks. Digging out slowly, but so very ready for sunshine and warmth. 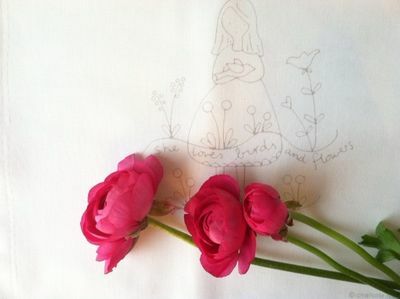 Daffodils, ranunculus and colored bits of thread certainly do what they can.